Greetings from The 88 Project! We are excited to unveil the searchable database of political prisoners in Vietnam – our latest initiative that is intended to support the advocacy and assistance efforts for political prisoners and their families. The database allows users to search prisoner profiles using such criteria as year of arrest, gender, ethnicity, areas of activism, charges, and length of sentence. It will be updated weekly with the latest news on trials, releases, health conditions, and family situations. The database is now live at https://vietnamprisoners.info, where detailed profiles are already available for many prisoners. Please contact us with any information that you believe should be added to the database. Onto the news, analysis, and actions regarding human rights and civil society in Vietnam during the week of January 8-14. Environmental activists Hoang Duc Binh and Nguyen Nam Phong will be tried on January 25. Former teacher and pro-democracy activist Vu Hung is now formally charged of “causing public disorder” after being taken into custody on January 4. Catholic activist Nguyen Van Oai, who was arrested almost a year ago for allegedly violating his parole from his original sentence, will appeal his new, five-year sentence on January 15. Protestant Pastor Doan Van Dien remains detained without official arrest papers almost a month after he was taken into custody. Singer and activist Mai Khoi has been selected as PEN America’s January Featured Case (and she’s coming to Netflix in 2019!). In the news, read analysis regarding Vietnam’s new cybersecurity initiatives, the recent corruption crackdown, and climate change. Please take action for Nguyen Van Oai and Mai Khoi. Two activists, Hoang Duc Binh (above) and Nguyen Nam Phong, will both face trial on January 25. 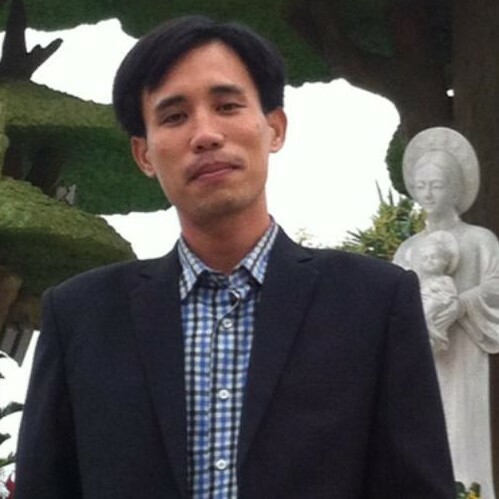 Hoang Duc Binh was arrested on May 15, 2017, in Nghe An province when he escorted Catholic priest Nguyen Dinh Thuc from the Song Ngoc parish in Dien Chau district to Vinh city. The police stopped their car in Dien Chau district’s center and violently removed Binh from the car. When the police ordered the driver, Nguyen Nam Phong, to open the car to let them take Binh out, Phong refused. Six months later, on November 28, 2017, Nghe An province police also arrested Phong. Binh, vice president of the independent Viet Labour Movement and well-known blogger who covered news on the environmental disaster caused by Formosa, is charged with “resisting persons in the performance of their official duties” under Article 330 and “Abusing democratic freedoms to infringe upon the interests of the State” under Article 331 of the new 2015 Criminal Code. Phong is charged with “resisting persons in the performance of their official duties,” under Article 330. Nine days after being taken into custody, former teacher and pro-democracy activist Vu Van Hung is now formally charged with “causing public disorder” under Article 318 of the new 2015 Criminal Code. He was kidnapped from a lunch meeting on January 4, 2018 and will now await trial in incommunicado detention. Nguyen Van Oai‘s appeal trial will take place on January 15. Oai was sentenced on September 18, 2017, to five years in prison for an alleged parole violation after his July 2011 arrest and four-year sentence. Oai is a well-known Catholic activist who was arrested and tried along with thirteen others in January 2013. January 9 marked five years since Oai and thirteen other Catholic bloggers and activists were tried under Article 79 for peaceful activities. They received between 3 and 13 years in prison in the mass trial. Ho Duc Hoa, serving 13 years, and Nguyen Dang Minh Man (above), serving 8 years, are still imprisoned. January 12 marked a year since Catholic activist Dang Xuan Dieu, one of the fourteen, was released, after six years in prison, and forced into exile in France. We reported last week that police arrested former prisoner of conscience, Protestant Pastor Doan Van Dien, for unknown reasons and without official documentation in December; it is now thought that he has been detained since December 17. His son, Doan Huy Chuong, believes Dien’s arrest is a ploy to actually arrest Chuong himself. Dissident singer Mai Khoi is PEN America’s January Featured Case. She has been suffering increasing levels of harassment as she increases her activism and outreach. During the past two years, she has been evicted multiple times from her homes, her concerts have been raided, and she has been detained by the police. Nevertheless, she continues pursuing her musical activism, which includes recording new albums and organizing new performances. PEN writes: “Khoi, a fiercely independent artist in a single-party communist state that criminalizes dissent, is no stranger to trouble. She has been stalked and harassed and has had her concerts raided. Despite the backlash, Khoi is a prolific artist who has released seven albums to date and is planning to release a new album with her band, Mai Khoi and The Dissidents—a group that could best be described as free jazz meets ethnic music—in 2018.” Khoi is currently the subject of a feature-length documentary that is planned to air on Netflix in 2019. Please contact us if you are able to offer assistance to this activist at risk. Tweet in support of dissident artist Mai Khoi with PEN International. Share Front Line Defenders’s Urgent Appeal for Nguyen Van Oai ahead of his appeal trial on January 15 (scroll to bottom for pdf).